Ohio’s Quentin Poling runs with the ball on Saturday night. Ohio defeated Idaho, 36-24. Photo by Carl Fonticella. 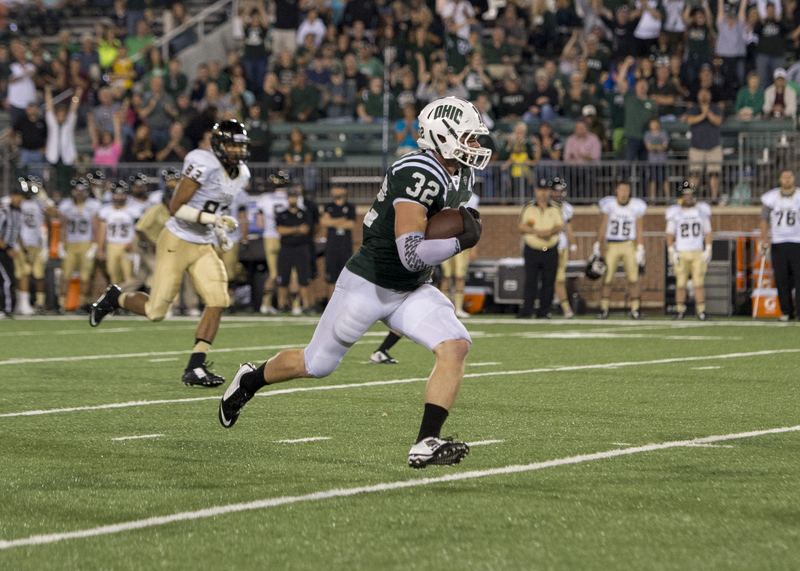 The Ohio Bobcats were relentless in all phases Saturday night during the Peden Stadium season opener. How Ohio responded to multiple mistakes and misfortunes made throughout the night against the Idaho Vandals defined the final score: a 36-24 Bobcats victory. Things did not start out smoothly for Ohio, however. A first-drive fumble by running back Daz’mond Patterson on the second play of the game prevented the Bobcats from sending early messages to the Vandals on both sides of the ball. In typical Frank Solich fashion, the Ohio coach yanked Patterson and inserted true freshman A.J. Ouellette, who led Ohio on its first scoring drive with 57 yards on three touches. Mistake led to opportunity, and subsequently Ouellette helped his team produce points. Derrius Vick and wide out Sebastian Smith finished the job with a 12-yard touchdown strike. Idaho attempted a quick, but lengthy, response. The Vandals’ second series was kept alive by two key fourth-down conversions. A Brandon Purdum tip at the line of scrimmage abruptly ended an Idaho retort, leading to a Quentin Poling interception with the Vandals at the Ohio 24-yard line. After its first score, the Ohio offense fluidly worked its way around the Vandal defenders. Vick set up the Bobcats’ second touchdown with a 54-yard option run. Three plays later Ouellette took a direct snap from one yard out to put the ‘Cats up 17-0 near the beginning of the second quarter. Idaho answered right away, chipping away at the Ohio defense with another extensive drive that also ended with a one-yard touchdown run. A huge response from the defense during Idaho’s ensuing drive — a stuff at the one-yard line with the Vandals facing a fourth and goal just before halftime — put the Bobcats in a favorable situation heading into the second half. Filling in for the injured Vick, J.D. Sprague took the opportunity that was presented to him and kept the Bobcats ahead. Sprague led Ohio to four scoring drives in the second half, but Idaho would not go away easily. Following another critical interception by Poling that led to a one-yard scoring scamper by Sprague with just under eight minutes to go, the Bobcats looked in control. But seconds later Joshua McCain hauled in his second of two key touchdown grabs for the Vandals, a 52-yard cutting route that narrowed the score to 29-24. The legs of Sprague and Ouellette came to Ohio’s aid on the successive drive, with Ouellette eventually – and finally – putting the Vandals out of reach with his second touchdown run of the game. “Once we get on a roll, we’re pretty hard to stop,” Sprague said. Poling sealed the game for the ‘Cats with his third interception of the night, stopping Idaho from spoiling Ohio’s home opener. The Bobcats will be at Peden for a second straight weekend when the Eastern Illinois Panthers visit for a 2 p.m. game next Saturday.